Oasis - Heated Private Pool. Beach and Cafes Just One Mile Away. 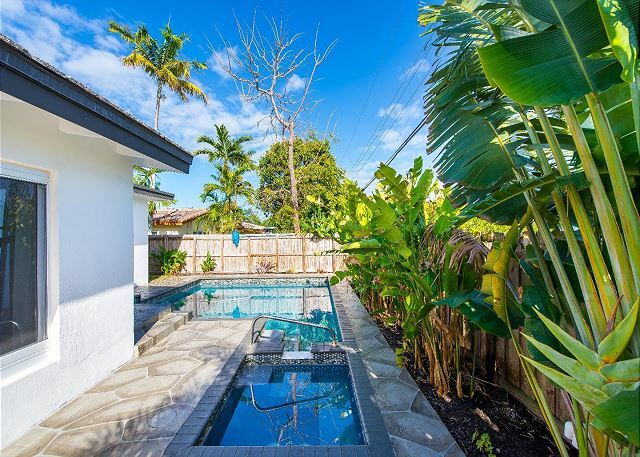 Luxurious private heated pool with tropical landscaping surrounding pool deck. 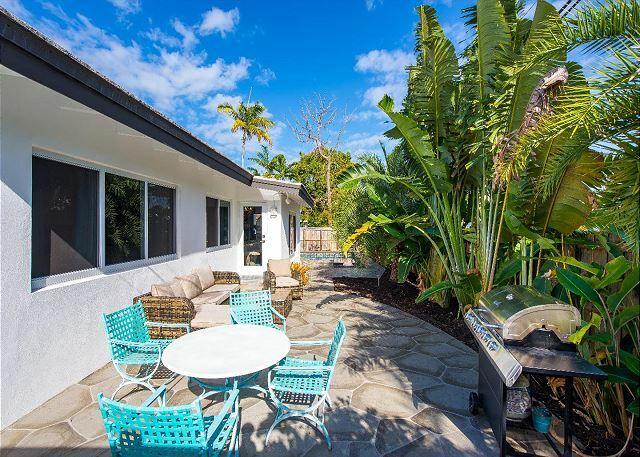 Fire up the grill to enjoy a sunny barbecue overlooking the expansive pool deck. Step right up to the dramtic white travertine tile front entrance. High vaulted ceilings and ceramic driftwood tile flow throughout. A wall-mounted 72” flat screen TV awaits in the living room and double glass doors lead to patio..
Modern wicker armchairs and a plush beige couch with queen size sofa sleeper offers cozy seating in the living room. Seating for 8 at the large wooden table provides a nice setting overlooking the lush landscaping outdoors. Formal dining next to the living room is ideal for small or large gatherings. Glass-top table with 4 chairs is perfect for quick breakfasts and casual lunches before starting your day. An eat-in kitchen offers solid white cabinetry, and a full suite of stainless steel appliances. A double-door fridge/freezer and coffee maker adorn the kitchen. The master bedroom with a king-size bed has soft linens and plush pillows. 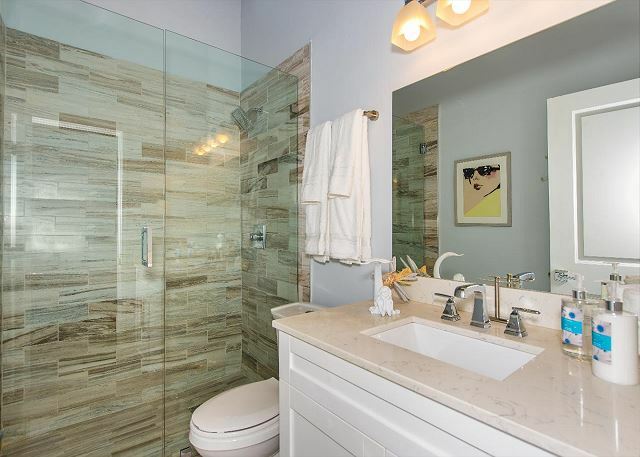 An en suite master bath features a marble vanity and walk-in glass-door shower. The second bedroom features a full-size daybed with twin trundle bed and white wood furnishings. The colorful second bedroom has a closet and wall-mounted flat screen TV great for late night shows. Guest bathroom with a marble vanity and tub/shower combo is ideal for pampering after a long day sunbathing at the beach. The third bedroom includes a queen-size bed and dark wood furnishings for accents. There's plenty of storage in the third bedroom's dresser drawers and closet. 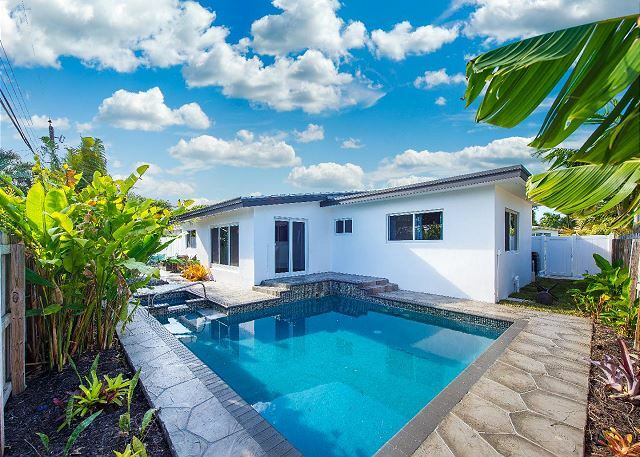 Large expansive private pool and pool deck is perfect for working on your tan. The patio boasts wicker lounge furniture and a grilling area complete with a bistro table for four. Enjoy a sunny day overlooking the expansive pool deck while sipping a tropical drink. Step right up to the white travertine tile front entrance, and head inside AFFINITY Seabreeze. Space is open and airy, with a light color palette and sunshine flooding in through large picture windows. Vaulted ceilings and ceramic driftwood tile flow throughout. The living room invites you to sit back in modern wicker armchairs and a plush white couch with queen size sofa sleeper to watch a 72” flat screen TV. A jute area rug and blue accent pillows enhance the high-end coastal décor. Just beyond, a pendant light hangs above a wood dining table set for 8. The chairs are dramatic yet comfortable while dining on your favorite foods. 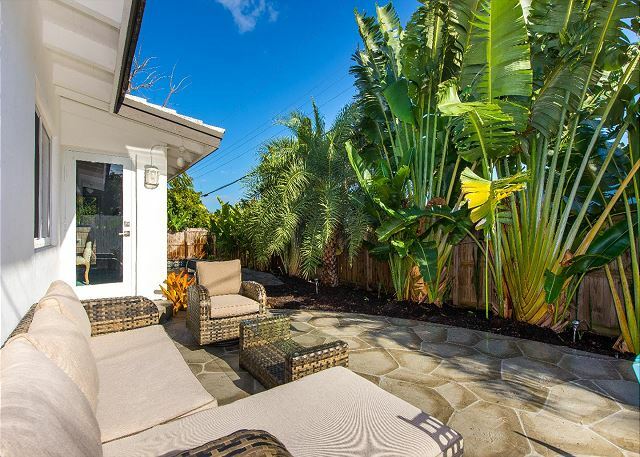 The glass windows allow you to enjoy the outdoor lush tropical landscaping. An eat-in kitchen offers a glass-top table with 4 chairs, stocked white cabinetry, and a full suite of stainless steel appliances, including a double-door fridge/freezer. Behind the kitchen, find a stacked washer/dryer, 2 cruiser bikes, beach equipment, and a half bathroom with a marble vanity. The master bedroom is just off the kitchen, with a king bed, matching driftwood furnishings, and a 70” flat screen TV. An en suite master bath features a marble vanity and walk-in glass-door shower. Off the main living area, 2 additional bedrooms with Roku TVs share a guest bathroom with a marble vanity and tub/shower combo. The 2nd bedroom features a full-size daybed with twin size trundle and white wood furnishings, while the 3rd bedroom includes a queen bed and dark wood furnishings. 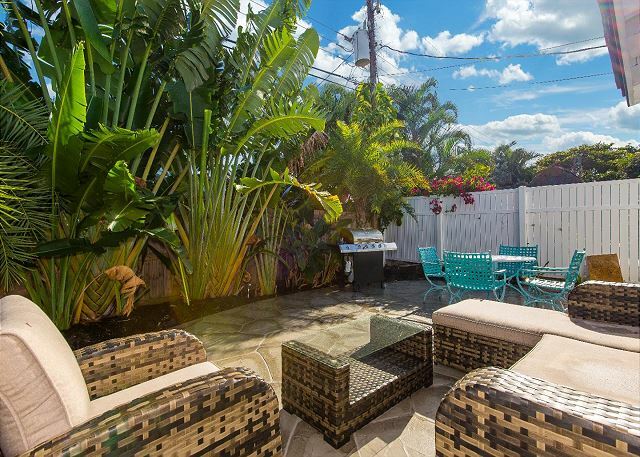 Step out to a private back patio that’s perfect for outdoor entertaining. The patio boasts a luxurious heated pool, wicker lounge furniture, and a grilling area complete with a bistro table and four chairs. 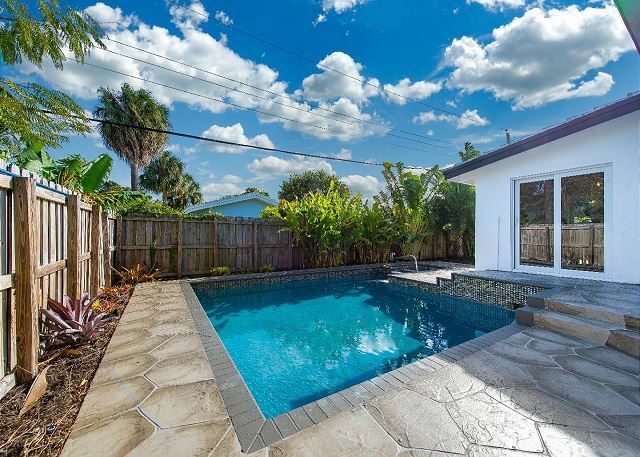 With a slice of paradise right in your own backyard, you won’t have to go far to soak up the Florida sun. Relax in your private heated pool, sip cool drinks from the sleek patio seating, and fire up the grill to enjoy a fun family barbecue. Hop on a cruiser bike and pedal over to the beach, or take a 15-minute stroll to arrive there on foot. Choose from an abundance of thrilling water sports and active pursuits, or simply lounge on an endless stretch of sand. Ready to hit the town? Find a slew of shops, bars, and restaurants on Atlantic Boulevard, a 10-minute walk away. Our home is also centrally located between the vibrant nightlife of Las Olas and the elegant dining and shopping of Mizner Park in Boca Raton, each a 25-minute drive away. To explore further, exciting South Beach, Brickell and Miami is only 30 minutes away by car. We loved our stay at Affinity Oasis! It is a beautiful home, within a short walk to the beach. We absolutely loved the privacy and convenience of the private heated pool. We have 3 kids, so the kids were able to wake up and swim all day, with a short trip to the beach each day to break things up. Affinity answered any question or need that we had immediately. They were phenomenal to work with.